As president and CEO of Warren Henry Auto Group, Warren Henry Zinn epitomizes carrying on the family legacy. The Zinn family has a long history in the auto industry, beginning in 1955 when Warren’s father, David, sold Lincolns in the Bronx, later selling Chevys in Miami Beach and eventually opening Florida’s first Toyota dealership in 1965. Warren was born with a passion for cars, and, as a child, he spent many years learning the family business with his father. Larry Zinn joined his father’s dealership in 2008 as the manager of Warren Henry Infiniti and is now the group general manager, and partner of the Warren Henry Auto Group. The Zinns are developing a 5.5-acre campus in North Miami, located at 151st Street in the $4 billion SoLe Mia development. 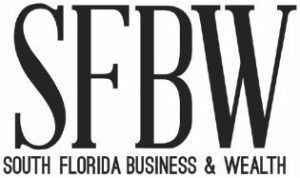 The Warren Henry Auto Group will relocate its corporate headquarters along with Warren Henry Infiniti, Warren Henry Jaguar, Land Rover North Dade and Koenigsegg Florida stores. Warren Henry Auto Group encompasses 13 franchise locations from Miami-Dade to Gainesville, including Jaguar, Land Rover, Infiniti, Lamborghini, Audi, Koenigsegg, Toyota, Ford, Chrysler, Dodge, Jeep, Ram and Warren Henry Pre-owned. 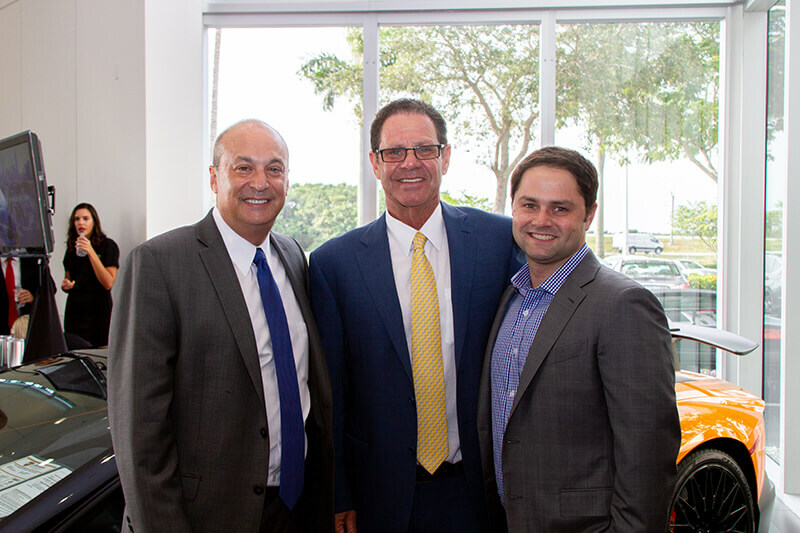 SFBW Chairman and CEO Gary Press interviewed Larry and Warren Zinn at their Lamborghini Broward dealership in Davie. The father-and-son duo provided a warm and playful interview for this edition of “CEO Connect,” which had the audience laughing and cheering. Warren: I’m driving a full-size Range Rover. Larry: I’m driving a Range Rover Evoque with diesel. What do you like about diesel? Larry: The truck weighs 5,000 pounds and I get 25 miles to the gallon, 500 plus to the tank. If I didn’t tell you it’s a diesel, you wouldn’t know. It’s super-quiet and drives nicely. How do you approach your father/son relationship from a business standpoint? Warren: Truthfully, we can’t stand each other. Larry: It’s a nice thing for me, because, working for my father, I get to work with my best friend. It’s an opportunity to spend time with my dad. He’s a great teacher. I learn more from him every day than he would ever know. We have a great relationship. We don’t get to spend that much time together, even though we work together. I’m sure you get into arguments once in a while. What would you say is the biggest disagreement you’ve ever had? Larry: I’ve been fired three times. Did you hire him back? Warren: I don’t remember the third time. Larry: I just came back to work anyway. I’m not sure If I still have a job, but I keep coming in. How do you see electric cars affecting your business over the next decade? Larry: We don’t see electric cars taking over the market completely. By 2025, we expect it to be around 10 percent of the market. You’ll see a lot more hybrids and plug-ins. I think something we both want to see developed—but it’s going to take time to develop the infrastructure—is hydrogen. Ultimately, it’s the way of the future. It’s one of the most abundant elements in the universe. There’s no reason why we couldn’t be able to run our cars off of it. Hopefully that will happen, and we will have truly clean vehicles. Warren: It’s a challenge, electric vehicles. Nobody is making money, selling them today. Look at the darling of electric vehicles, Tesla. Their losses are astounding. In any event, people who have electric cars really like the fact that they don’t have to go to a gas station. But most of the people that have them are also very mindful of how many miles they have left; where are they at, at a charge. There is still something called “range anxiety.” And they aren’t really as clean as they make them out to be. There’s a lot that goes into charging the vehicles and the batteries for them. The biggest question is, what happens when the batteries are disposed of? It’s a nice thing and we certainly see it moving forward, but there are still a lot more questions. What do you think about driverless cars and where’s that going? Warren: Have any of you experienced being in a driverless car? It’s kind of frightening. In my experience, driving several of them, I’ve had the opportunity to drive the Nissan ProPilot Q50. And that was partial autonomous drive. You follow the car in front of you very nicely, and they all make the turns around the corner, but when you put on the directional signals to change lanes, Tesla in particular, just swooped right over dramatically into the lane next to me. This was something I would have never done if I were driving the car. So I said to the instructor, the guy in the car, that I was uncomfortable. He gave me some story and I went on to try it again. Well, I put the directional signals on again, and I cut the same guy off. They have a lot of evolving to do with how far in front of a car you’re actually going to travel. And how do they go around a turn? Can they see a turn if it is covered in water or snow? Flex Wheels, the subscription model that you are doing … is that something that’s catching on around the country? Warren: Yes, it is something that’s going on around the country. Different groups are doing it, but a lot of the manufacturers are jumping into this space. The difference between our model and BMW or Audi’s model is, we offer a wide range of brands, where they are restricted to their specific brands. Warren, in 2007, you saw a big need to change how things were done in your business. Tell us how you managed to do that and your advice on managing change. Warren: What we saw was a big decline in business that started to come in 2007. I really saw the manner in which we were doing business and the way the car business had been done from the time that I had grown up in it. I saw that it needed a change. And we were fortunate that we won many, many times [awards for being] the best dealerships to work for. That’s been critical for us, but I really wasn’t able to get a sales staff to buy into the changes that I wanted to make. We had a lot of longstanding employees that were very set in their ways. There was something I always wanted to do: Bring people in, particularly customer-facing people, from outside the industry. Not “car people,” not people who have worked at other dealerships, but people who have worked from other industries and bring them in and go through the sales process in a way that we felt needed to be done. Candidly, I was never able to do that until my son came aboard. Because seasoned sales managers, the last thing they really wanted was another individual they would have to train. So when Larry joined, I told him that we are not hiring any more people who look like me. I wanted them to look more like him. And he thought I meant handsome. But Larry was very helpful in putting this together with the people. When you think about that space of time, Circuit City was going out of business—all these different companies were going out of business—and those people needed jobs. They had good customer handling skills and they weren’t from our industry. Larry: I didn’t really have much of a choice. Because when I first got put into the sales manager position, half the staff quit. I was 22 years old and most of the staff wondered, “What is this kid going to teach me?” So half of them left. What my dad just said, a lot of companies were going out of business, so I started setting up meetings with HR directors from companies that were going out of business, asking for opportunities to meet with people to try to bring them in. My first sales meeting, after half the staff quit, I was determined that I was going to sell a lot of cars that weekend. There were four of us left. Saturday, I set an 8 o’clock in the morning sales meeting and I was all pumped up. And the oldest salesman on the team had a heart attack in the middle of it. We didn’t sell any cars that weekend. It wasn’t really a strong start. Warren: At Larry’s sales meetings, we like to leave on a stretcher. Larry: I don’t do Saturday sales meetings anymore. Eventually, it led to a different culture for us. When we brought in people from outside, when they fell on their habits, they fell on good habits because it was all they knew. They followed directions, so we started to spread that model throughout the company as time went along. And it really paid off. We are very fortunate to have been ranked one of the best dealerships to work for over the past five years running. And last year, we ranked No. 1 in the United States. Warren: He just got out of college. In any event, he had come down and he had worked in the dealership some prior, and he had gotten training at an automotive college, which was where I had graduated from. And we ended up in a circumstance where Larry started in F&I, where one of the managers left. And then right after that, we were subjected to an audit. And we found what we called a silent partner. So Larry, by default, ended up in that position and then truthfully the rest is pretty much history. Warren, you were once quoted as saying, “We’re really only as strong as our dumbest competitor.” What did you mean by that? Warren: I got a lot of quotes. Well, really part of how we judge ourselves is by our competition. What we say beyond that is that’s great we are ahead of all the competition. We could be the smartest kid in a dumb class. So we really want to make sure that we’re continuing to move ahead, and that’s not all what we pay attention to. What the competition does is important, but it’s not what we live and die by. You have several construction projects, including the five-acre campus in North Miami. What can you tell us about those and how it fits in with your strategy for growth? Warren: How this fits in our strategy is that we’ve been operating in the same facilities along Highway 441, the Warren Henry part of the company since 1976. We’ve seen some ups and downs. For many, many years, we’ve been in a space far from our customer base, and we had the opportunity with this project that we are tentatively moving by January. It’s something we’ve been working on for seven years now. We’ll have over 2,000 spaces for cars. We’ll have the capability of having an excess of 360 charging cords for electric cars within the building. We have corporate staff sprinkled throughout our facilities. Warren, you grew up in the family automotive business. Your father was the first Toyota dealership. Did he work with Jim Moran? Warren: No, he was actually years ahead of him. My father started selling Toyotas when nobody knew the difference between a Toyota, a Seiko or a Nikon. So that’s where that was. Going to work with my father was always great because if I didn’t go to work with him, I never got to see him. He worked from opening to closing, six days a week until I was about 15 years old. And once in awhile, he took a night off. We went to work in the morning, when it was dark. We usually were in a customer’s car that had been fixed the night before and we would drop it off at their house, picking up the loaner car. This was 1966, taking the loaner car into work and/or dropping that loaner car to another customer’s house before we got in by 7:30 a.m. to open up the dealership. The stores used to be closed on Sundays, and on Saturday nights when we were closing, my father would say that I could take the rest of the week off. Automotive News has given you accolades about having some of the best dealerships to work for, including No. 1-ranked Lamborghini Broward. What makes these results possible? The sponsors are Celebrity Cruises, Greenspoon Marder, Shorecrest Construction, CenterState Bank and FlexWheels.